Darth Vader’s Star Destroyer, larger and more awesome than the five Imperial Star Destroyers that surround it, sits in the vastness of space. Starts with the first full appearance of the awesome Star Destroyer known as the Executor and ends with Darth Vader declaring that "the rebels are there". The first appearance of Darth Vader the Sith Lord in the movie - applause shot. 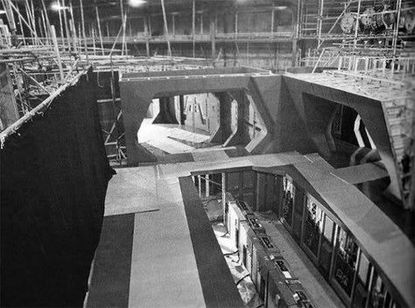 A ridiculously enormous Star Destroyer is shown. First appearance of three Imperial Officers - Admiral Ozzel (Navy), General Veers (Army), Captain (for now!) Piett. The Executor is called that as it will carry out, or execute, whatever you want done. Darth Vader really is obsessed with Luke based on his performance in this minute. He seems to mention Luke at every opportunity. Capture him and bring him to the Emperor? Kill the guy that blew up The Death Star? Partner with Luke to kill the Emperor? Be a part of Luke's life to make up for not being there in his early years? Damon issues a general "Sorry Pete". Vader refers to Luke as "Skywalker" in this minute but then calls him "Luke" in person when he's trying to get through to him. The movie cuts from a shot of the huge Star Destroyer to the back of Darth Vader's helmet as he looks out into space through a window that we don't actually see. PTR says that, given this shot, a few people assumed that Vader's helmet was actually his spaceship and this is what he flew around in. The Executor has similar unsafe Imperial decor to all of their other spaceships. Starving (because they can't get out of the pits). Injured (because they've fallen off the catwalk). How do people - including Darth Vader - get up to and down from the catwalk that we see him on? A little ladder somewhere? This would be very undignified for Vader to use. The Executor is constructed 'top-down', and reflects the hierarchy of the Empire, so perhaps there is no way to get down from, or up to, the catwalk. At the end of the day the workers knock-off and go down from the control room to their dark and dank living quarters. There is probably three feet of water in the working pits that sloshes around when the ship turns and also contains multiple dianogas. Admiral Ozzel is dismissive of Captain Piett's conclusion about the Rebels being on Hoth. How does Vader know that the Rebels, and Luke, are on Hoth when he sees the image on the monitor? He may have had a vision and needed a picture / image of somewhere to confirm exactly where it was from. He was looking into the future. OR he was just saying that about every location they looked at due to his obsession with Luke (which may explain why Ozzel was so exasparated and dismissive). Vader has moved from being somewhat subservient to Imperial Officers to the clear leader by this point. Referenced: Jaws from Moonraker (Bond 007). Millennium Falcon on The Death Star (Captain Khurgee) - escape pods were jettisoned and the log says that the crew abandoned ship; no-one aboard. This Hoth scene (Admiral Ozzel) - so many probes; it's probably nothing. PTR points out that General Veers is NOT like this. The super Star Destroyer is a ridiculous size. Everything is getting bigger and bigger in the movies. Now that The Death Star has been blown up the Imperials have been relegated to driving around, and living in, their vans (i.e. the Star Destroyers). PTR worries that talking about Vader being Luke's father may be a spoiler (note - OVER THIRTY years later! ); the other hosts think it's fine. PTR says that the Imperial Officers in this minute and movie are what made him like Imperial Officers, and the structure of the Imperial Armed Forces, as much as he does. Was A prolific Doctor Who guest star (he appeared - as different characters - with the 1st, 3rd, 4th, 5th and 7th doctors). Played a historical figure in Indiana Jones and the Last Crusade (the figure signs Jones's book in the movie). Played that same historical figure four other times in his career. The actor that played Captain Piett (Kenneth Colley) played a religious figure in The Life of Brian. This scene is therefore an argument between a historical figure and a religious figure. The religious figure wins/takes over his job. The actor that played General Veers (Julian Glover) also played a character in Indiana Jones and the Last Crusade. Before Ozzel served on The Executor he served on a different Star Destroyer called The Reprisal. Ozzel is argumentative and bullish; another example of Alex's pet peeve. Support the Show - Facebook, Twitter, 8-DAY-GREEDO, starwarsminute.com. Damon: <To the hosts after they correct him on a small mistake regarding the opening crawl> Oh, whatever, I didn't spend...a whole hour...talking about it. Damon: <As Alex says starwarsminute.com in the outro> STAR WARS MINUTE.